Firethorn ‘Soleil d’Or’, or pyracantha coccinea ‘Soleil d’Or’, is a sturdy evergreen shrub with a dense growth habit and prickly stems. Being so thorny, firethorn ‘Soleil d’Or’ is able to deter intruders quite effectively, which makes it very reliable for security hedges. Firethorn ‘Soleil d’Or’ can be distinguished from other firethorn cultivars by its lighter green elliptic leaves and golden yellow fruits. The profuse berries are an excellent source of food for birds throughout the winter and the fluffy white flowers – borne throughout summer – are loved by bees. Firethorn ‘Soleil d’Or’ is not only valuable as an intruder hedge, but can also be trained against a wall. This delightful plant is well-known for its abundant berries and thorny nature, but should also be valued for its exceptionally tough and hardy nature, although it must be protected from excessive exposure. Firethorn ‘Soleil d’Or’ is therefore best suited for inland gardens. Firethorn ‘Soleil d’Or’ can be trimmed into a rather formal style or left a more natural look. Trim at least once a year, ideally right after flowering. This hedging variety will reach 1.5m tall at an average growth rate of 20cm p.a. 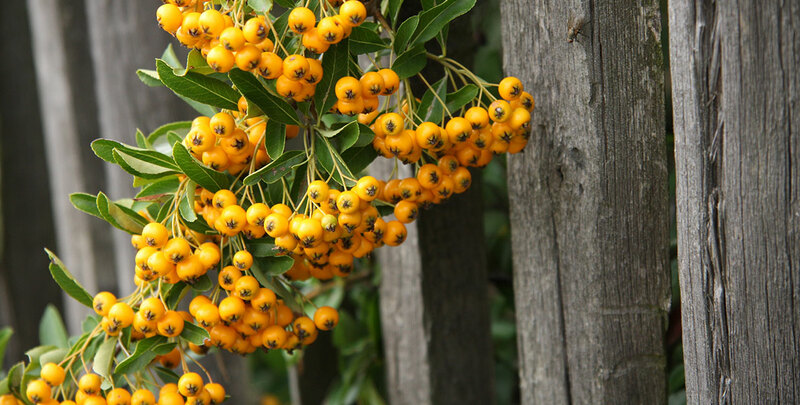 Pyracantha ‘Soleil d’Or’ can be planted in any fertile well-drained soil in full sun to partial shade.